Over 11 million people in the U.S. suffer from chronic obstructive pulmonary disease (COPD), the third leading cause of death. COPD is a progressive disease that irritates, inflames, and weakens the lungs. An excess of mucus is produced that obstructs the lungs and makes breathing difficult. Smoking is the primary cause of COPD; with no cure, much of the medicine is preventative . Collapse of the central airway of greater than 50% has been associated with cigarette smoking and COPD. This condition has been named expiratory central airway collapse (ECAC), because the collapse occurs upon exhalation. This has been shown to result in an overall reduction of respiratory health of the COPD patient . It is hypothesized that this collapse results in additional resistance to air flow and hence amenable to interventional therapy. 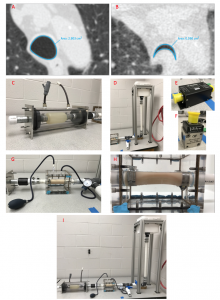 The aim of this project was to develop a bench-top lung simulator to mimic the collapse of the central airway and measure the resistance to fluid flow. The lung simulator was designed as a flow loop with water as the medium. Using water instead of air allows for the use of pumps, and the water can be measured more easily. A bladder pump allows for compressed air to pressurize the chamber within which it is held, thus allowing the bladder full of water to compress and push water through the loop. Therefore, the bladder pump allows for controlled beating similar to both cardiac and pulmonary rhythms. Water is held approximately three feet above the pump and flexible tubing models the central airway, thus providing a pressure head on the system. The reservoir allows for water to be pumped continuously in the piping of the system. The flexible tubing is necessary to model the collapse of the central airway. A box was designed to contain the tubing and to be air tight. Air is compressed into the box with a modified sphygmomanometer. The tubing within the box is collapsed by positive pressure. The bladder pump, reservoir, and chest cavity box are connected in series to complete the flow loop. The bladder pump is controlled by a computer system and controller to provide successive compressions. This drives the water through the flexible tubing in the chest cavity box and up into the reservoir. Pressure and flow sensors have been installed and are being calibrated. The flow loop design has been finalized, but sensor calibration is required to begin experimentation. Further investigation with the measurement of the changes to pressure and flow rate across the collapsed tubing (airway) compared to no collapse is necessary. This study will help physicians determine corrective measures by evaluating the effectiveness of interventional therapies, such as stenting of the trachea to stop the airway from collapsing. Future endeavors include patient specific 3D-printed airways from CT scans. Lung Health and Diseases. American Lung Association. http://www.lung.org/lung-health-and-diseases/lung-disease-lookup/copd/. December 18, 2017. Figure 1. (A and B) CT images of ECAC patient (see reference ), (C) bladder pump, (D) reservoir, (E and F) pressure sensor system, (G) trachea box with modified sphygmomanometer, (H) collapsed tubing, (I) respiratory simulation flow loop.